Online mapping emporium Multimap has launched an online carbon footprint calculator. 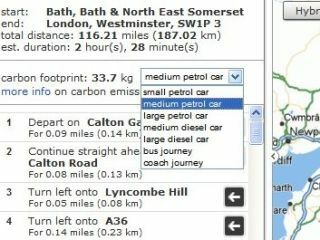 Motorists using Multimap will be able to see the carbon footprint of their planned journey and, if they want to, take steps to offset their journey, says the company. The site has partnered with carbon management company Carbon Clear. "This service will give motorists the opportunity to better understand the carbon footprint of their journey," says a release from the company. "It also allows users to compare the carbon footprint of making the journey in a small, medium or large car (both petrol and diesel), by bus, or by coach." The difference between a bus and a coach is somewhat strange, but otherwise it all seems like a good idea, if only for shock value.